Food-gathering slime molds can build a complex network as efficient as Tokyo’s rail system in just 24 hours, without giving it a second thought! How do they do it? We usually think of mold as a nuisance that crops up in all sorts of inconvenient places, like week-old bread. Yet God created mold to serve a crucial role in His world: to seek out and consume decaying matter. Consider the amazing “seek-and-consume” ability of one common mold, Physarum polycephalum, found in the woods. You may have seen its red-orange-yellow color on a fallen tree or mulch pile. This mold sometimes appears almost overnight. It consists of a group of tiny, single-celled amoebae, which have both plant and animal characteristics. Also called slime molds or social amoebas, they are very different from the mold found on old bread. The variety that eats decaying wood seeks food by sending out thin strands in various directions. When a nutrient is located, tendrils with the shortest and most efficient path thicken, while other unsuccessful branches pull back. They made a large, blank map of the Japanese region around Tokyo on a flat surface. Oat food flakes were then placed on this “map” at the locations of several major cities. Mold was introduced onto a central location, representing Tokyo, and allowed to grow outward to the nearby “cities.” In just 24 hours the mold colony had self-organized and formed a network of connections between the food sources on the map. To the surprise of scientists, the resulting links were nearly identical to Tokyo’s rail system. The researchers are building models that simulate the slime mold’s behavior and will apply the results to future transportation projects. The efficient connections shown by the mold may lead to efficient new designs for highways, communications networks, and power grids. Even in medicine, we may learn how to counteract the branching growth of dangerous blood vessels that support deadly tumors. Who would have guessed that cost-efficient network designs and medical research could be aided by observing the behavior of lowly slime mold? This organism is commonly thought to be a simple, primitive form of life. However, these experiments show that mold is well equipped to perform its complex role in creation. Mold simply does what its Maker programmed it to do from the beginning of time, and now it is inspiring new engineering. In the future we may even find ourselves traveling on mold-inspired highways. Dr. Don DeYoung chairs the Science and Mathematics Department at Grace College, Winona Lake, Indiana. 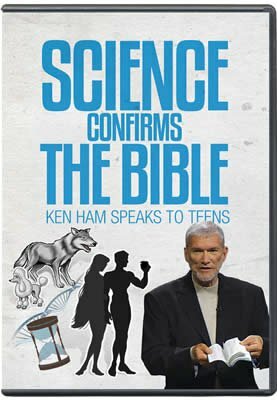 He is currently president of the Creation Research Society. His website is DiscoveryofDesign.com. 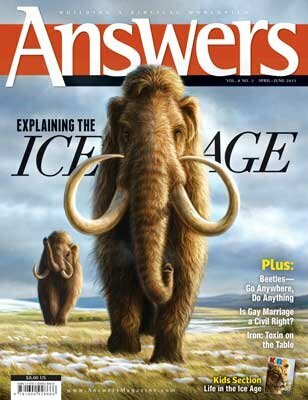 What unique conditions were required to start the Ice Age, and where does it fit in Bible times? Why did Ice Age animals grow so big, and what happened to them? 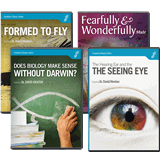 Also, can you explain why God made more species of beetles than any other animal? Can you prove that Genesis 1–3 is not a Near Eastern myth? Read the answers to these questions and many, many more in this issue! Atsushi Tero, Seiji Takagi, Tetsu Saigusa, Kentaro Ito, Dan P. Bebber, Mark D. Fricker, Kenji Yumiki, Ryo Kobayashi, and Toshiyuki Nakagaki “Rules for Biologically Inspired Adaptive Network Design,” Science 327, no. 5964 (2010): 439–442.